At Exmark, we are always focused on the changing landscape of turf care. We're committed to making the products and features you need today, and anticipating the ones you'll need tomorrow. Our technology is always being refined, and our products are always being improved--often in revolutionary new ways. Today more than ever, Exmark leads the industry with exciting innovations designed to increase engine life and boost overall productivity. Our advanced RED Onboard Intelligence Platform powers unprecedented communication among key systems on our mowers. The result is better reliability. Increase durability. And, better efficiency. 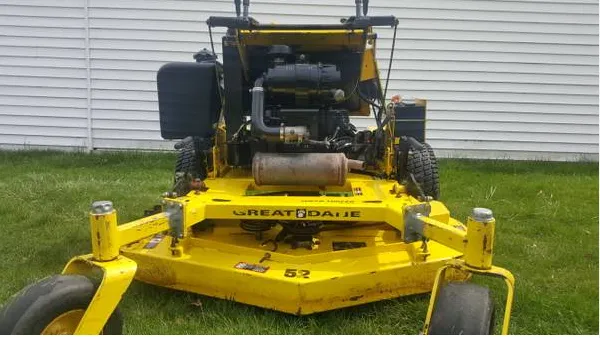 For mowing commercial and residential properties during the summer growing season, and clearing snow during the winter, professional contractors rely on our trusted brands for productivity, durability and increased efficiency. At The Toro Company, we take great pride in helping our customers enrich the beauty, productivity, and sustainability of the land. The Toro Company thrives on innovation. From our beginnings in 1914, we built our name and following by providing innovative solutions to customers' agricultural and turf care needs. Today, this rich legacy continues as we strive every day to develop exciting new products and services that deliver the ultimate in performance, productivity and convenience customers have come to expect from Toro. Scag makes Scag mowers, nobody else makes them for us and we do not make mowers for other companies. Scag mowers are assembled by highly trained individuals using the latest technologies such as pulse air torque guns. Mowers are run at the end of the assembly lines to ensure that the following items are up to specification: engine RPM is set, all safety switches are checked for proper operation, fluids are filled, systems are checked for leaks, and neutral and tracking adjustments are set using special dynamometers that apply load to the drive system. These steps add to the value of every Scag mower and ensure the product is the best it can be when it leaves our factory. Innovation differentiates our product and it gives us an advantage in the industry. It is fundamental that our products demand and derive value for us and our customers. Innovations continue to be made to the product line including a focus on better fuel efficiency and improved performance. Efforts continue to be made at the factory to increase efficiency in manufacturing with better machines and improved processes including the implementation of a new manufacturing software operating system. The Walker Mower is distributed throughout the United States and into 28 other countries. We are thankful for the thousands of people who have recognized the benefit of our product and invested in a Walker Mower. We truly enjoy how our product brings people together and the relationships we have formed over the years. On September 19, 2011, company founder Wesley "Max" Walker went home to be with the Lord. Max left a legacy of honesty, hard work and a commitment to loving people. Those who worked with Max would describe him as a servant, a friend and a faithful follower of the Bible. It was easy to see that he had the entrepreneurial spirit, yet he was careful to always recognize the Lord as his source of blessing, talent and strength. Walker Manufacturing continues to run under the direction of Max's two sons: Bob oversees the business and marketing areas of the company, and Dean oversees product development and manufacturing operations. The Walker family maintains 100% ownership of the company and is carefully planning for the third generation of Walkers to carry on the business. Frustrated with flimsy grass catchers that clogged up, Bill bought a welding machine and fabricated the first aerodynamic, continuously welded, tubing frame commercial grass catcher. Other landscapers wanted to buy them and dealers wanted to sell them. Wright Manufacturing was born. Wright endeavors to deliver the most innovative, safe, and efficient products in the commercial market. This desire drives us toward continuous improvement and the constant process of eliminating waste. This being the part of our motto that involves only the Wright team causes us to recognize our great responsibility to do this with excellence. We will be known and judged by our ability to design, manufacture, and support our products. We take great pride in our workmanship and stand by our products through their lifecycle. We are motivated to do our work knowing we provide value to our customers as they build teams, their businesses, and their lives. Each business we touch through our products and other means of outreach is made up of people desiring a meaningful and joyful life. We wish to be a part of making their lives meaningful and joyful. Yes, we think of the individuals employed with the distributors, dealers, and landscapers who utilize our products to build their businesses. We wish for their personal success. As we strive to continuously improve our products, to improve our processes, to eliminate waste, etc… we believe we are touching their lives. This motivates us to truly approach our work Everybody – Everyday in a way that brings honor to their lives and work. Welcome to Ferris Industries, the commercial mower specialists. We've earned our reputation by delivering our customers high quality products and solutions for over 100 years. You can be sure Ferris will keep you on the cutting edge, with innovative mower designs and technology, for years to come. Ferris mowers are the only mowers in the industry that offer patented suspension technology. Experience the difference suspension makes! Ferris...Go The Extra Yard! Our patented suspension technology delivers maximum productivity, increases mower longevity, reduces fatigue, enhances comfort and leaves a beautiful manicured finish every time. Ferris will provide you with the best built and most innovative equipment in the industry with a support network that is second to none! For more than 50 years, Snapper has been trusted as a leading premium brand in the outdoor power equipment industry. Snapper Pro offers professionals like you a complete line of rugged and reliable commercial lawn mowers and accessories. We offer a full range of commercial lawn mowers with powerful engine choices such as Kawasaki®, Kohler®, Vanguard BIG BLOCK™, and Yanmar™. Cutting widths are available from 21- to 72-inches. Our team of commercial mowing engineers has over 20 years experience in the industry. Each model in the landscaping equipment line has been constructed to withstand the daily rigors of commercial mowing. Our goal is to provide you with tough, durable and innovative commercial mowers at an affordable price. Snapper Pro - value you can depend on! The quality, value and price points of the Snapper Pro line of commercial mowers can't be beat, which means more money in your pocket! Since its founding in 1837, John Deere has seen a great many changes in its business, its products, its services. Change always comes with opportunity. And Deere has always been ready and willing to embrace it. Yet, through it all, John Deere's mission is still dedicated to those who are linked to the land. And Deere has never outgrown, nor forgotten, its founder's original core values. Those values determine the way we work, the quality we offer, and the unsurpassed treatment you get as a customer. You’ve got places to be, lawns to mow, jobs to finish. John Deere is right there with you every step of the way, with full line of commercial mowing equipment that we believe can handle any need. One of the world's most recognized corporate logos, the leaping deer trademark has been a symbol of quality John Deere products for more than 135 years. High productivity and user friendly designs, making your lawn care tasks a breeze! Husqvarna commercial turf care equipment are for professionals who tackle the toughest lawn care jobs. We offer a wide range of lawn equipment, with the power and performance you need. Hustler Turf Equipment was born of a simple need - a mower that would maneuver the irregular landscape of the family home - complete with bird baths, gardens, and winding front walkways. The first Hustler was a compilation of mower parts and farm machinery, created by a genius named John Regier. Mr. Regier’s mower cut grass and steered like no other. It could hug a flag pole or reverse directions at a fence line, with a turning radius of zero. With this, the world’s first zero-turn mower was born. And it changed everything. Since then, Hustler has become one of the leading turf care brands in the world. Across the globe, the Hustler brand signifies innovation, quality and superior customer care. In addition to manufacturing the best-in-class mowers, Hustler is committed to providing a quality owner experience. Our mission is to provide the most dependable, useful, and time-saving products in turf care, while providing unmatched customer loyalty and the best warranty in the business. From day one, Cub Cadet has focused on making innovative, high-performance products, large property owners and professionals can tackle any challenge. Which is why everything that bears the Cub Cadet name meets and exceeds the highest standards. It's one thing to talk innovation and customer service – it's another to back it up. We partner with the nation’s best retailers who understand our products, and can service our customers from the first day of purchase through every season in that product’s life cycle. And while other businesses continue to look to the past and live on their longevity, we are committed to developing products for today and tomorrow. We think progressively and innovate in a meaningful way. Our outdoor power equipment is smarter, tougher, and simply put, just better. The world around us is constantly advancing. Shouldn't the machines we use to care for it advance too? Contact us at (330) 495-6441 to find out what lawn mowing equipment that we have in stock. Or you can look in our online store.